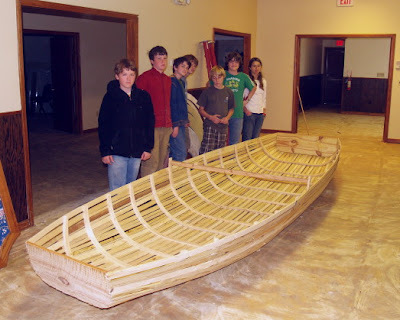 Today the 7th and 8th grade students and high school students all worked on the boat, so we got a lot done. The photo above shows adding additional strips to the gunnels and beginning to add the floor. Doug Stowe vividly remembers the day in college when he was working on the restoration of an antique Ford. His mentor, who was helping him that day, said, "Doug, I don't know why you are studying to be a lawyer when your brains are so clearly in your hands." In response to his mentor's advice, Doug began taking pottery classes in college and later moved to Eureka Springs to become a potter. In 1976, he began working with wood at a small furniture shop to supplement his income. This is when he discovered his true calling to be a woodworker. Doug Stowe has been selected by the Arkansas Arts Council as the 2009 Arkansas Living Treasure. Now in its eighth year, the Arkansas Living Treasure award recognizes an Arkansan who is outstanding in the creation of a traditional craft, who has elevated his or her work to the status of art, and who actively preserves and advances the art form through community outreach and educating others. Joy Pennington, executive director of the Arkansas Arts Council, said the award not only recognizes individuals who create traditional crafts, but also ensures that we help encourage the continuation of these crafts for years to come. From 1976 to 1995, Doug was a self-employed craftsman making custom furniture and a line of small boxes. In 1995, Doug wrote his first book and has since written numerous articles for a variety of woodworking magazines. He has published five books and one woodworking DVD, with his next book and DVD scheduled to come out in fall of 2009. In 2001, after noting a severe decline in participation in crafts by younger generations and specifically a decline in woodworking programs in schools, Doug developed the Wisdom of Hands program at Clear Spring School in Eureka Springs. The purpose of the program, he said, is to demonstrate the value of woodworking in general, non-vocational education. 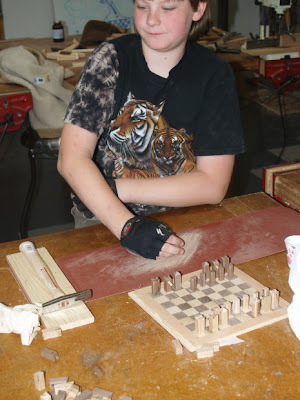 His belief is that all children can benefit from the intellectual development that woodworking can provide. Today he is the director of the program and also a teacher at the school. Doug has also become an international advocate for hands-on learning for children. He has twice presented papers on the subject at universities in Finland and Sweden. 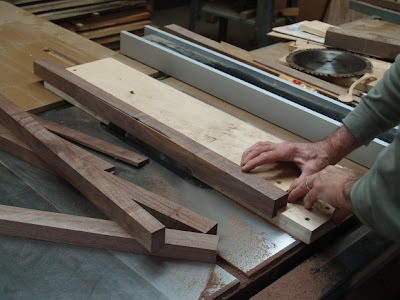 Doug continues to write regularly for a variety of woodworking magazines, and he also contributes daily to a blog that attracts readers from all over the world. Doug only uses native Arkansas woods in his work, and he is entirely self-taught. A reception to honor his work will be held Sunday, May 17, from 2-4 p.m. in the Conference Room Conservatory in the Crescent Hotel in Eureka Springs. For more information about Doug, visit his website at www.dougstowe.com. The eminent English scholar and scientist, Sir James Chrichton Browne, tells us that certain portions of the brain are developed between the ages of four and fourteen years by manual exercises alone. He also says, "It is plain that the highest functional activity of these motor centres is a thing to be aimed at with a view to general mental power as well as with a view to muscular expertness; and as the hand centres hold a prominent place among the motor centres, and are in relation with an organ which in prehension, in touch, and in a thousand different combinations of movement, adds enormously to our intellectual resources, thoughts, and sentiments, it is plain that the highest possible functional activity of these hand centres is of paramount importance not less to mental grasp than to industrial success." Again he says, "Depend upon it that much of the confusion of thought, awkwardness, bashfulness, stutterings, stupidity, and irresolution which we encounter in the world, and even in highly educated men and women, is dependent on defective or misdirected muscular training, and that the thoughtful and diligent cultivation of this is conducive to breadth of mind as well as to breadth of shoulders." The fifth and 6th grade students worked on their chess sets today, designing kings and queens. More sanding is required and next week we will begin making the boxes with drawer to hold the pieces. 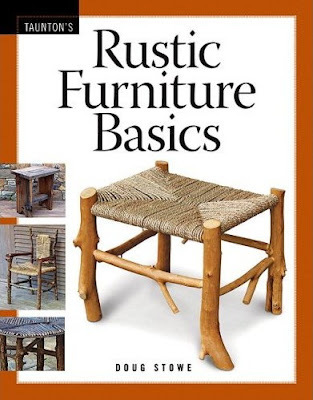 My new book Rustic Furniture Basics is now listed on Amazon. It won't actually be available until fall, 2009. It is nice to see it listed. Today, the 3rd and 4th grade students continued making rockets, lunar landers, rovers and a space station. It was fun and exciting. I doubt that many would understand the ways that making things enhances verbal skills. If a person had doubts, a few minutes in my Clear Spring School work shop, listening to kids explain what they need next would convince. The 1st and 2nd grade students made boomerangs as part of their study of the continent of Australia. To make the boomerangs, the kids cut their designs from folded paper, so that when open it made the complete symmetrical shape. They traced the design on wood, so I could cut it out with the scroll saw. Next, they sanded the edges and we went out for test flights. Finally, the boomerangs became an art project through the use of colored markers. Both of these projects involve development of spatial sense. In making rockets, the children plan how things will look and then have the challenge of making things do what they have imagined. Not always as easy as one might think. In making the boomerangs, the use of folded paper to form a symmetrical shape is also a tool that is specifically useful in the development of spatial sense. Just as in algebra, one side equals the other. In the meantime, the spalted maple table top which I am finishing with Danish oil at left is one of the prettiest yet. When I am having fun at my work, it is hard to show restraint. It is one of the dangers. If children are encouraged to make things, they may never stop. I have confidence that this new table design will sell, so I am making another. This one has a top similar to the others, spalted fiddleback maple, but its base will be sugar maple instead of the walnut used in the earlier versions. The joy of creating is one of the things that has enabled me to survive as a craftsman. When there has been an absence of orders, I keep busy anyway, maintaining my positive mental outlook by stimulating the neurohormones that arise in the system from the engagement of the hands. Things don't always sell right away, but things do sell, often bringing income when it is most needed and least expected. The meandering line cut through the middle of the board provides a space for expansion and contraction to take place without altering the dimensions of the top, and it serves another practical purpose. It allows the wide material to pass through my small planer. In addition, it provides a distinctive appearance that many people have come to associate with my work. 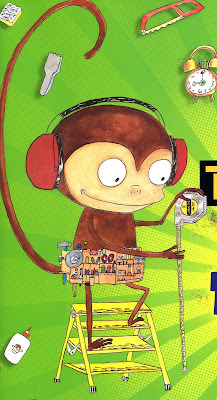 I don't do book reviews very often, but Monkey with a Tool Belt is very special... It is just the kind of book I would have loved if I were 4 or 5 years old. I know because I love it today. If you have young children with an inclination toward making things and fixing things, or if you have young children who have never thought such things possible, these books by Chris Monroe are perfect. Fun, imaginative, entertaining. There are two books in what I hope will become a series, Monkey with a Tool Belt, and Monkey with a Tool Belt and the Noisy Problem You never know. Some kids might be inspired to think, "If a monkey can fix things and make things and have so much fun, maybe I can too!" 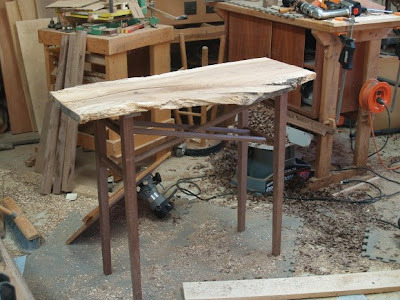 I have assembled the table base for the maple slab I finished on Saturday. It will get three coats of Danish oil and then be ready for the top to be fitted. Today I will do prep work for classes tomorrow at Clear Spring School. Our kids are finished with their trips, having arrived home, worn out from the intense learning. And one of the important lessons is getting along with others in the kinds of challenging circumstances that travel can present. Next Sunday, one week from today, I will be a featured writer in the Books in Bloom Literary Festival in Eureka Springs. My presentation will be the last of the day, from 4:30 to 4:55 in the readers' tent. How-to is easy to write and rather than nursing readers off to bed at night, it inspires them to head for the garage or basement workshop to burn midnight oil exercising creativity and developing skill. Doug will cover selection of subject matter as well as the processes of writing and documenting work. The How-to of How-to is based on his experience writing 6 books, 2 DVDs, and over 30 articles for national magazines and is aimed at leading writers to exercise their creativity toward the inspiration of others. Join me in the reader's tent. Be there and be square. We all know parts of the story. We've seen it on TV, and in a minute, I'll tell the part you may have missed. First, I had a question from a reader concerning what I mean when I've said in the blog that "I'm competing with the Chinese." In clarification, no disrespect is meant. I have profound respect for the people of the world who are makers. It is not easy and I feel a sense of alignment with them. The comment is intended to point out the rarity of the craftsman in today's culture. It is a special privilege, and I am deeply honored when some choose to support me in my work. 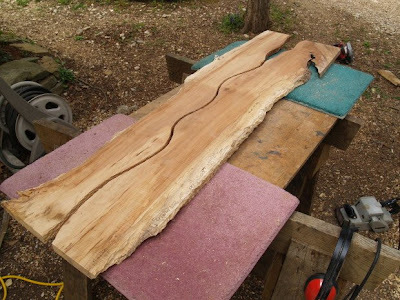 Today I am making another table from spalted maple and walnut, and this is an exercise in gauging my efficiency, to help in setting a selling price. I think this will be a successful product that I will try to sell through a few select galleries. Each will be unique, because the wood is unique. But there will be similarities enough that I can make them at a profit. And now, you all remember Cinderella, the wicked step-mother and ugly step-sisters, and you may recall in the Disney version, Cinderella singing joyously in the garden and kitchen as she served her unappreciative and demanding family. The simple untold story is that that is what happens when you are aligned with the universe. Neurohormones triggered by engagement in creative activities brings forth a sense of joy. That joy is noticed by others. It may make them jealous. You noticed that in the Cinderella story, there were magical things happening with fairy god-mothers, pumpkins, mice and the like. We often use magical beings as a means through which to explain inexplicable phenomenon. The most important part of the Cinderella story is not something that is told, but it is something you can discover for yourself. This isn't just something I'm making up. Check out Kelly Lambert's theory of "effort driven rewards," and you will find that joy arises from the simple tasks we might be twisted toward believing are beneath our dignity. While the step-mother and step-sisters were poisoned by self-importance, Cinderella worked with her hands and expressed joy. Make, garden, sew. Compete (in a friendly fashion) with the Chinese. You will discover joy. You will notice that an ugly step-sister of a maple board can turn beautiful with sanding and some Danish oil. Makes me want to whistle while I work. Oh, wait a minute... that was another Disney movie, wasn't it? We know that our present scheme of industry requires a large supply of cheap, unskilled labor at hand. We know that this precludes special training; that the education which should develop initiative, thoughtfulness and executive force would not turn out facile recruits for our present system. And, if we are honest, we know that it is not intended that these qualities shall be secured more than is required to take charge of running the machinery to which the masses are subordinate. As stated by author Reese, "Unfortunately, "initiative, thoughtfulness and executive force” were not destined to be the hallmarks of vocational education as it unfolded in the twentieth century." Unfortunately our nation abandoned Educational Sloyd in the early part of the 20th century. Sloyd was designed to build those elements of character that our schooling chose to neglect. The practical businessman thinks most of us dreamers. He thinks the artist a dreamer. He says: "The artist is not a practical man." It is practical to pay fifty thousand dollars for the painting of a dead man but it is not practical to make the painting--it is practical to buy the evidence of another man's growth, but it is not practical to do the kind of work by which men grow. He does not want the all-around man: he wants the specialist. But the specialist that is worth while is always the round man. There is a line--a perfectly clear one, it seems to me--that we can draw on the machine, and that is the line where the machine ceases to be a tool. No matter how costly, therefore, or complicated the tool is, so long as it is a tool with which a man expresses himself, it is an advantage and a benefit to that man. The moment it ceases to be that, the moment it becomes a thing which does the thinking, into which the unthinking man feeds the material we (must) reject it. In the dark ages when they wanted to torture a man beyond all possibility of his holding up under it they did not torture him with thumbscrews, or the maiden, or the boot. They put him in a room without interests, where there was nothing to do, nothing to see, and dropped a drop of water with deadly regularity on his head, and he invariably went mad. I accuse the present system of doing precisely that thing. The man who has to stand at the tail... of a machine, doing uninteresting work--monotonous, regular, but without any interest, without any volition--is in exactly the same position as the man with the water dropping on his head... As manual training teachers you should realize that it is not enough to take the children into your school rooms and give them a glimpse of heaven if hell lies just outside of the door. Here is this great school of industrial art which teaches people year in and year out how to design beautifully, how to weave properly, how to dye properly, and then gets them jobs which require them to do the very reverse... the demand is not for the best thing that man does but the worst--for the purely commercial thing. That is not enough. 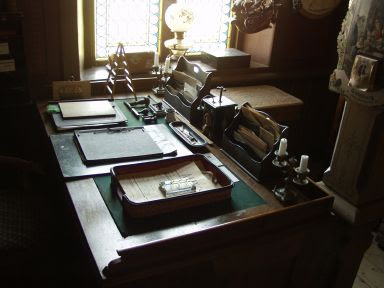 That is why I am making this plea for the arts and crafts; that is the connection that I see between the Arts and Crafts movement and manual training school. 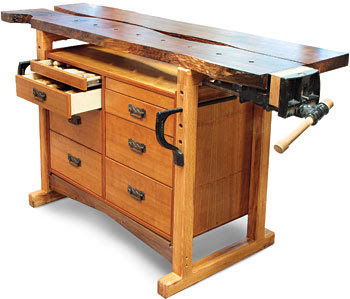 The manual training school has done much to make the Arts and Crafts movement possible. I have no statistics for this statement; you do not need statistics for such thing--you simply know them; you cannot go on teaching and training these young people for twenty-five years that is its right to do things that are worth while and not have some of them adopt the teaching. Will Price would be good reading in these times. As an architect he was an advocate of modest homes, even for the wealthy, suggesting that all avoid the complex of "keeping up with the Joneses." As a leader of the Arts and Crafts movement, he was founder of Rose Valley, a planned community near Philadelphia. "The Swedish system is based upon the Fröebelian idea of the harmonious development of all the powers of the child, tools and exercises being chosen with reference to this end, and all merely mechanical methods being carefully avoided. The Sloyd teacher does not say, "Now I will teach this boy to saw, and he shall continue to saw until he can saw well," regardless of monotony or the too prolonged use of the same muscles. The problem of the Sloyd teacher is to find the tool, whether knife or saw or plane, and also the series of exercises, best adapted to the present need of the average pupil, and also to vary or alternate the tools and to graduate the exercises with constant reference to the growing capacity, the formative age, and to the various activities of body and mind." 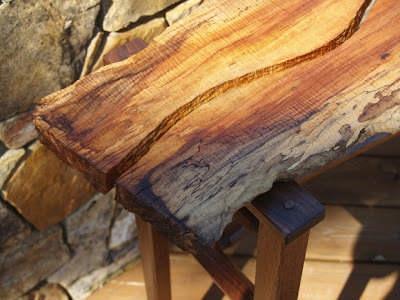 Greenwood Global is an organization that trains artisans to work with wood. "GreenWood trains artisans to make high-quality wood products, adding value to forest resources and creating incentives to protect biodiversity." Some of my readers may know that my work with wood has been motivated by a desire to share the beauty and diversity of our American hardwoods. I have avoided imported woods in large part because of the importance of this mission. Working with indigenous species of woods, whether you are in the Amazon rainforest or in the hills of Arkansas, can be a means through which to heighten environmental awareness and understanding. People and the environment are not two separate entities, but one interdependent whole. 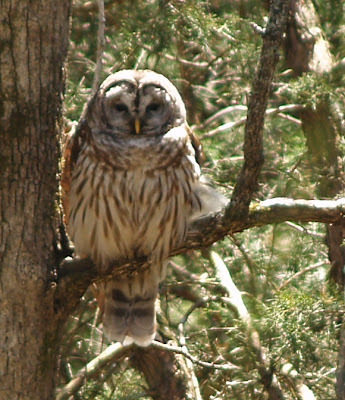 GreenWood believes that the best way to protect a forest is to enlist the participation and support of the people who live there—the folks who stand to gain the most by its sustainable management or to lose the most by its destruction. The good news is that the people who make their homes in isolated forest communities often comprise their strongest line of defense—but only if they can connect their own personal livelihood to the survival of those forests. That's where GreenWood focuses its attention. 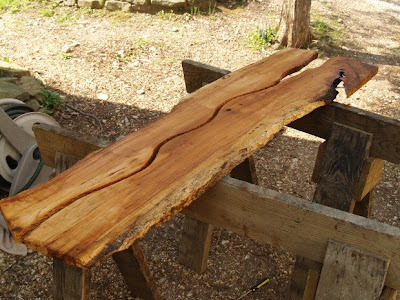 Woodworkers have a unique opportunity to reveal the beauty and value of our native woods in a way that encourages understanding and preservation of our trees and forests. This is true whether you are in the hills of Arkansas, the boroughs of New York or in the remote jungles of Peru. And where ever you are, there are ways to help. Is there time for manual training? That time can be taken for Sloyd without injury to the common school studies has been proved over and over again in places where the matter has been adequately tested. Even when the time has been taken directly from the ordinary studies, the increased ability to grasp the other subjects has more than made up for the loss of time. A child who turns from books to tools continues to think. He will think more clearly, and he will reach a more definite end by his thinking, if the problem is before him in concrete form as it is in Sloyd, than if he has to consider an abstract problem such as is given him in books. We should do well to follow Horace Mann's advice, "Give one-half of the school time to creating a desire to learn, and you will teach more than by devoting all to books." In addition to the fact that the pupil's interest is greatest in the concrete problem, it has been scientifically proved that the mind as well as body is strengthened by judicious physical exercise. It is also true that, although the overworked student may be earnestly thinking out his Sloyd problems (and I have the testimony of many teachers, themselves students of Sloyd, that this same Sloyd problem in wood costs them more careful thinking than had ever been given to their algebra, Greek, or Latin), nevertheless I believe that the change from hours of sitting still to the vigorous physical activity of Sloyd affords such relief that some of the evils of over-study may be counteracted thereby. A well-known principal of a high school once said to me that he believed that he could prepare his students for college in half the time usually taken, provided the other half be given to well-directed manual training. Time is thus gained, not lost. Old Bishop Comenius's idea of teaching may be well applied here. "It is to seek and find a method of instruction by which teachers may teach less, but learners learn more, to inspire the children with the love of learning and to bring greater happiness to mankind through active doing." "My understanding of carving has been framed by these tools and this work they have created. Framed not only in the intellectual and imaginative sense, but in the very way that muscle groups within my hand, wrist, arm, shoulder, back, legs, control the gouge and the resulting mark. This is a very physiological process, not merely psychological. Because I have learned to carve in this way, in this practice, with this gallery of works, I am, in at least one sense, co-temporal with the Egyptian or Mediaeval carver, which is to say that as carvers we inhabit the same world, the same time. Their gestures, action, have become mine, mine were theirs. This is what creates links across time, and why the presence of an ancient object so made is to have times meet in a way that is absolutely shocking." What Malcolm Martin describes is the foundation of human culture. Take the hand away and see what's left of it. "We're makers. Our experiences are different from most other people around us, and this ties into the political. We're looking at a country where nobody makes anything. Industry is leaving the United Sates and we're not even in industry, we make things by hand. Although this paradigm is in opposition, we're not thinking negatively but positively by providing a role model and template for what we'd like to see -- a society that makes things." When you realize that making has been the defining characteristic of the human species since its origins, you begin to understand that we are at a crossroads. We are either to be redefined on the individual basis as mere consumers, or we are challenged to take life by the hand and make. When we know what the choice entails, we know we have no real choice if we hope to sustain the continuous thread of our humanity. We live empty or live full. In terms of meaning, consumption of stuff leaves us empty. Making things leaves us full. Sadly,there are those to whom circumstances have denied the full expression of their humanity. This afternoon, I've been competing with the Chinese again by making boxes and took a few minutes to finish the spalted maple and walnut hall tables made with round tenons. The boxes are now ready for sanding and could be ready to ship within a couple days if the orders come soon. One table will be placed in a local gallery and the other held for White Street Art Walk in May. 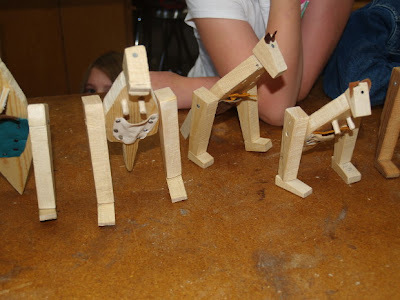 Today the 3rd and 4th grades students made rockets and the 1st and 2nd grade students finished their wooden kangaroos. Stephen, who often has hard days in wood shop, told me, "this has been a really good day!" We all have those kinds of days when things work and others in which we may struggle within ourselves. I ran across this interesting definition of craft from David Gates: "a series of intellectual acts rooted in a language of itself." We spend far too much time trying to explain what we do, and it is like hollering from one hilltop to another. 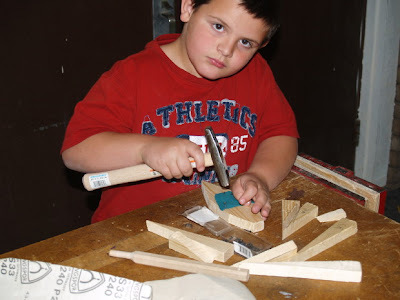 If children have not had the opportunity to learn the language of skill, creativity, spoken not by words but by movements of hands, shaping wood or other materials, they just won't get it either as children or as adults. You can holler from one hill to another, but the language is garbled and not shared well enough for the meaning to be understood. Paul Harper quotes Wittgenstein "Whereof one cannot speak, thereof one must be silent." But there is a language that must engage us in renewed dialog. It is where you take someone by the hand and introduce him or her to renewed creativity. It is why I teach at Clear Spring School and why I serve on the board of the Eureka Springs School of the Arts. We know that verbal language is a totally inept means through which to embrace creative reality, but there is a language of the hands that speaks clearly to the human heart. When I take photos of the kids with finished work, they often want me to take a silly picture so they can look goofy. In the photos you see the finished kangaroos with pouches and joeys and some of the kids being silly. with what William Morris called "the mysterious bodily pleasure, which goes with the deft exercise of the bodily powers." I am reading and enjoying an essay by Paul Harper called the Poetics of Making. But it leaves the challenge that craftsmen do a better job of explaining themselves. I would prefer that those who have no knowledge of crafts and making expand their vocabularies of understanding to embrace the beauty and coherency of making and of craft. In the effort to convey meaning, a crafted object is worth far more than words can convey, but you do need to have some familiarity with the language. Today at Clear Spring School the first and second grade students will be finishing their Kangaroos and the 3rd and 4th grade students will be working on rockets and space vehicles. I visited the Crystal Bridges Museum site in Bentonville today and got a tour from the museum director. It is an awesome development that will have tremendous impact on Northwest Arkansas. You can begin to understand the scale when you look closely at the photo and realize that those are people walking around down in the bottom of the valley. 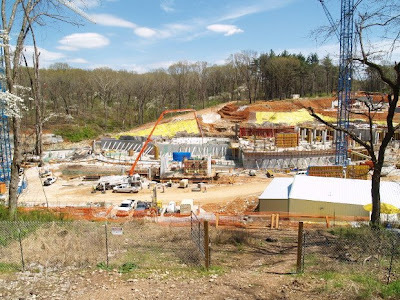 This photo was taken from an overlook along the bike trail where in the not too distant future, local residents can visit regularly to observe the march toward completion. 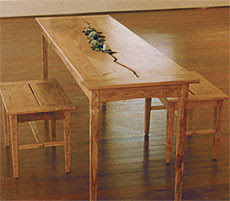 Regular readers will remember that Crystal Bridges will be the home of the walnut bench I featured earlier in the blog. It was a beautiful day to be outdoors. You can click on the photo to get a larger view. Those things most easily measured become the symbols of our success. But there are some things that cannot be easily tested that are of even greater importance. Arne Duncan, Obama's new secretary of Education is trying to promote a common set of standards through which the success of our children and our educational system will be measured. You can count the change in your pocket more easily than you can measure your real worth to community and culture, so money and income become more important than the full range of cultural values... more important (to some) than what we offer each other as responsible citizens. Duncan's idea is that as long as we have a clear set of uniform standards, teachers and classrooms will be free to explore methods used to reach those standards, and parents and taxpayers will feel comfortable that they are getting their money's worth. But teaching is an art. The object is not to drive a train down a fixed track to a known destination, but to ignite fires of brilliant engagement in lifelong learning. Administrators in education want results that can be measured, but there are many things that are extremely important that defy measurement. How about joy of learning? Education in America is a mess and I wish Mr. Duncan and the rest of us a great deal of success. In the past, with No Child Left Behind legislation, focusing on standardized tests led to "teaching to the test"... abstract test scores became more important than real life measures of accomplishment. Kids notice the difference and they hear the suggestion that abstract performance is more important than real world accomplishment. We know that when the hands are engaged our hearts tend to be engaged also. When the hands are engaged, they provide concrete evidence of real learning. The real revolution in education may not be forthcoming soon. Regardless of how uniform our testing standards become the real test is when students leave school either with or without the passion for learning required to live meaningful lives. April is the month that Clear Spring School students and teachers are involved in travel school. The entire CSS High School is in Washington, DC. In addition to all the usual things students do in DC, they hope they can arrange a visit with Secretary of State Hillary Clinton, who as a young lawyer, wrote the papers of incorporation for Clear Spring School about 35 years ago. On Monday the 5th through 8th grade classes will travel the state of Arkansas, following the White River from source to mouth, and later in the week the 3rd and 4th grade students will go to Springfield, Missouri on what has become an annual trip. Travel is always full of surprises. You think you may have an academic understanding of something, and when you arrive at the real deal, there are things that blow you away. Nääs is beautifully preserved and in visiting what becomes clear is that educational sloyd was not just about woodworking education. There was a gymnasium where gymnastics, dance, and a variety of indoor physical fitness educational methods were taught. There were indoor and outdoor meeting areas for lectures and discussion of progressive education. You just can't get a full 360 degree view until you are standing in the midst of it. When you learn something from a book, the lesson is often over as soon as the book is closed, but the experience of visiting significant places is processed over a period of time. Just as I am still processing and exploring what I learned at Nääs, Clear Spring School students are having travel experiences that will provide a lifetime of reflection and provide the foundation for further growth. Photos at top: behind the Nääs Slott and the gymnasium and athletic field at Nääs. Photos below: Of me in the original sloyd wood shop building, and August Abrahamson's desk in his "castle" or slott. "The most colossal improvement which recent years have seen in secondary education lies in the introduction of the manual training schools; not because they will give us a people more handy and practical for domestic life, and better skilled in trades, but because they will give us citizens with an entirely different intellectual fibre. Laboratory work and shop work engender a habit of observation, a knowledge of the difference between accuracy and vagueness, and an insight into Nature's complexity and into the inadequacy of all abstract verbal accounts of real phenomena, which, once wrought into the mind, remains there as lifelong possessions. They confer precision; because if you are doing a thing, you must do it definitely right or definitely wrong. They give honesty; for when you express yourself by making things, and not by using words, it becomes impossible to dissimulate your vagueness or ignorance by ambiguity. They beget a habit of self-reliance; they keep the interest and attention always cheerfully engaged, and reduce the teacher's disciplinary functions to a minimum. Of the various systems of manual training, so far as woodwork is concerned, the Swedish Sloyd system, if I may have an opinion on such matters, seems to me by far the best, psychologically considered. Manual training methods, fortunately, are being slowly, but surely, introduced in to all our large cities; but there is still an immense distance to traverse before they shall have gained the extension which they are destined ultimately to possess." There is a great article in the May Architectural Digest about Peter Korn's Center for Furniture Craftsmanship. Peter, with whom I shared judging duties at last year's Woodworker's Showcase says, "Craft is a way in which people explore for themselves how to be a human being, how to create meaning in life." This is pretty easy for most of us to understand. 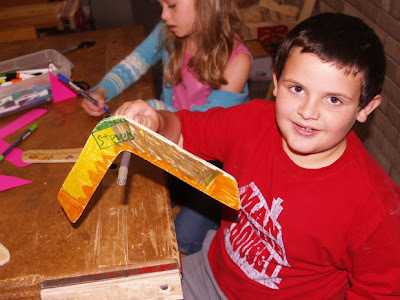 Sloyd, wood shop and formative education. 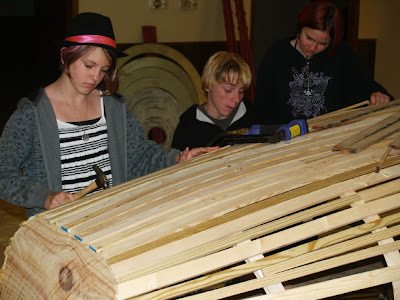 Some of us in the early part of this century were left wondering, “what happened to woodworking in schools?” and of course what happened as woodworking education fell into decline is very closely related to what happened in the earliest days of woodworking education. The present is key to the past, and vice-versa. 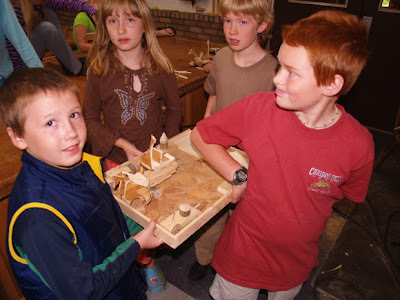 In 2001, I started a new K-12th grade woodworking program in a small independent school in Arkansas and visited North Bennett Street School while on a brief tour of other school programs. “Have you heard about Sloyd,” they asked, and that question launched my research that led to a number of articles published by Woodwork Magazine and which are now available on the American Woodworker website. (type sloyd in the search box). 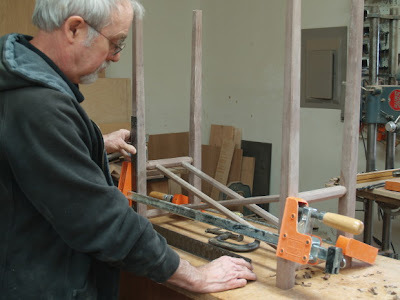 While my own woodworking program, Wisdom of the Hands, is not based exclusively on Sloyd, and we make no pretense of following the system as it was taught in the 19th century, there are reasons why modern furniture craftsmen should be particularly interested in Educational Sloyd and what it teaches us about the educational value of woodworking programs in today’s schools. 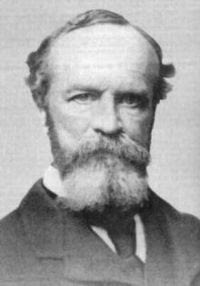 Otto Salomon, founder of the Sloyd teacher training school at Nääs, Sweden taught that Sloyd had two particular values in education, economic, and formative. Economic education involves preparing a student to do a specific task or teaching a specific skill that can provide monetary return to the student and his or her community. Formative education involves the development of character, strength, curiosity, resilience, intellectual capacity and understanding that prepares the student for a meaningful life. Any manual training teacher in the US sees those kinds of development of character happening in his or her students regardless of whether they are practicing Sloyd, but an important distinction is made in who receives the training, and who does not. And so, a system of education was established that was intended to isolate those who worked with their heads and hands from those who worked with their heads alone. As a nation, we lost our sense of the value of manual training in schools as we ceased to be primarily a manufacturing and agricultural economy. Our understanding of its value was based on what Salomon called “economic values.” The clear and widespread understanding of its other, formative values was put aside many years ago along with the passage of the Smith-Hughes and the decline of Educational Sloyd. So, how do we restore what has been lost? The first step is to recognize that work with the hands, with tools, crafting things from wood and other materials is essential to the development of all children regardless of social class and educational aspirations. From that understanding, we can begin to take matters in our own hands. "...persons not manually trained, generally regard the products of manual labour at less than their real value. They think it much more difficult to solve a mathematical problem than to make a table. It is not an easy thing to make a parcel-pin or a pen-holder with accuracy, and when students have done these things they will be the better able to estimate comparatively the difficulty of making a table or chair; and what perhaps is of still greater importance, they will become qualified to decide between what is good ad what is bad work, and thus avoid the misfortunes which befall the ignorant and credulous through the impositions of knaves. M. Jules Ferry, in opening a School for Manual Training in France in 1883, said: "In order that the nobility of handwork may be acknowledged, not only by those who engage in it, but by the whole community, we have chosen the surest and the only practical means; We have introduced it into the school. Do you not think that when the plane and file have taken a place of honour by the side of maps and histories, and handwork is taught in a rational and systematic manner, that many old prejudices will die out, and the traditional division into castes will disappear? Social peace will thus begin on the school benches, and future of our beloved nation will be crowned with a glorious halo of unity and concord." The Theory of Educational Sloyd is a collection of the lectures of Otto Salomon and contains a brief chapter on his life and the start of his school at Nääs. Pysical copies are getting expensive and hard to find but you can find a free copy for reading or download at Google Books. The book conveys a wealth of ideas about teaching and the value of Sloyd as a component of general education. To Teach through the Senses, Especially Touch and Sight. This question of teaching through the sense is very important. Pestalozzi says; "Instruction should be given, as far as possible, through the senses." When the senses are well trained, the recognition of a number of the qualities which a thing possesses is made simultaneously and accurately, at the instant that it is brought under the cognizance of our senses. The larger the number of qualities simultaneously recognized, and the more definite and accurate the cognitions are, the more perfect is the training. It is a recognized fact that, although all the senses may be employed in developing the understanding, yet tactual and visual sensation play the most important part in this development. Hence Sloyd is a means by which the pupil derives great advantage from the constant use of his faculties of observation and perception, through both sight and touch. This he cannon do so well when he sits a passive and patient listener to the dogmatic instruction of the teacher. In the former case every sense is quickened, and the pupil seems alert at every point. In the latter, one faculty--perhaps, more--is being employed, but the teacher cannot be sure of even one. The touch of, or glance at an object should be sufficient at once to determine accurately many of the qualities which is possesses. How can this best be done? It is of the utmost importance that the child be trained to observe for itself, and not expect everything, or even anything, to be pointed out to him. He must discover all he can for himself, and the teacher should show nothing which in his (the teacher's) judgment the child can discover by the employment of its own powers. 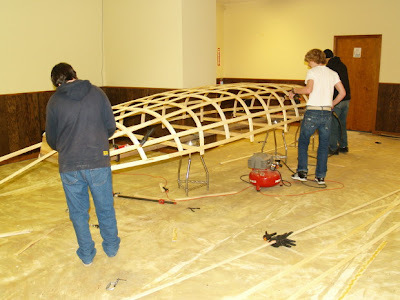 As you can see from the photos, we are nearing completion of putting strips on the hull. This afternoon we will apply the last few strips and then remove it from the forms so we can see inside. 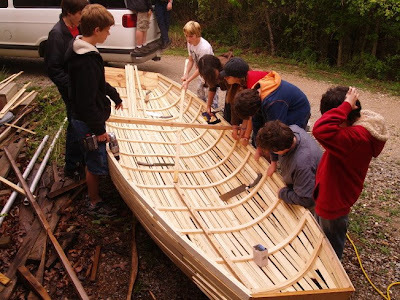 If we had a lot more time and if I were a great deal clearer in giving instruction and able to work with fewer kids at a time, and if this weren't my first boat building experience since I was the age of my students, we would be doing a better job of it. But we are having fun and the kids will be pleased to see if it floats. Hence the name, Silverfish of Doom. My first boat sank. Update... this afternoon we finished the strips and removed the boat from the support that held the ribs in position as the strips were nailed on. 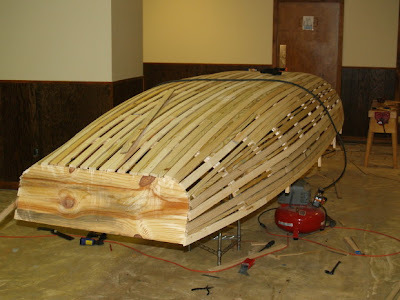 Now it has a shape, a size and an internal volume and is starting to seem like a real boat. A friend of mine explained to me years ago that the difference in whether you were enjoying something or not was related to your point of view... that the same task was variously defined as odious and objectionable or a delight based on a simple switch in the mind... Is this something I have to do, or is it something I get to do? That, for me, was a useful observation. 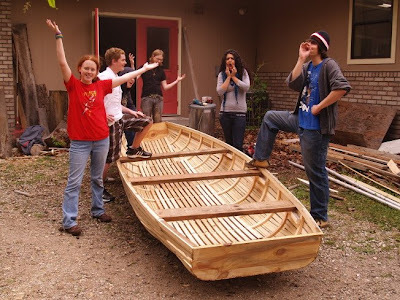 Today, I get to spend hours in the company of teens building a boat. I know that one might gain more status or prestige in teaching adults in a university base furniture design program, but could anything be more fun? 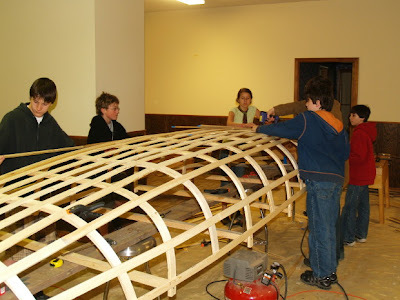 I have the 5th through 8th grade students helping me with the boat now. They are preparing for exploration (by car) down the White River, from source to mouth. So we are on a push to get it nearer to completion. We may not get finished in time for a crossing of the White River at Beavertown, but it would be fun. We are laying on additional strips so that the tarp used for the skin will have adequate support. 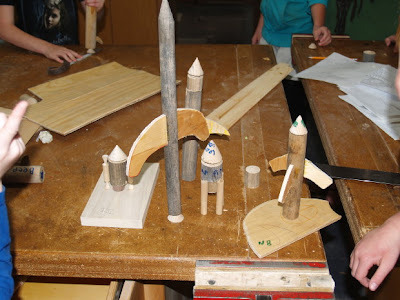 Today in the CSS wood shop, the 3rd and 4th grade students made rockets as you can see in the photo above. They started with drawings last week and explained to me what they needed in preparation for today... nosecones and nozzles. So I turned those on the lathe prior to class. 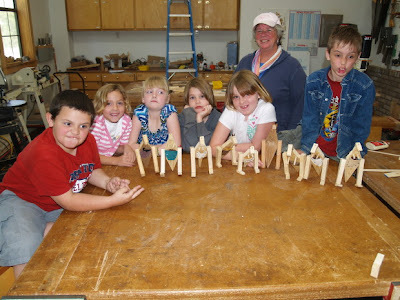 The 1st and 2nd grade students continued work on their wooden Kangaroos, which they will finish next week. This afternoon, I have been finishing my contemporary rustic tables, using modern walnut table bases to support rough edged, spalted fiddleback maple planks. Some would think the wood beautiful, some perhaps not. Some might find the unfinished textures offensive, but in my view, wood is nearly always beautiful and interesting, and making things from it can make it even more so. what you see is what you get, but are your eyes open? There is a difference between manufactured furniture and what you can buy from a curious and inventive craftsman, and the difference starts with the wood. I joke sometimes that I am in competition with the Chinese, and now if you go to a furniture store you may find "Early American" furniture made with American veneers like walnut and cherry bonded to core material from Borneo, then assembled and finished in China and shipped here and sold to American consumers for prices American manufacturers can't match. Add up all the back and forth shipping costs and fuel use, then the packaging and you begin to understand that if you want green furnishings that have less direct impact on the environment, you should order from a real person, have him or her make it start to finish with materials grown in your own community. A local craftsman will work without all the hidden costs to the environment that bargain hungry American consumers will never consider. Unlike American consumers, the global environment records every jot and tittle*. When you have a real craftsman make something of beauty, it may last generations, becoming a family heirloom and treasure while sequential generations of meaningless manufactured objects have taken their places in landfills to defile our natural beauty and poison our waters. The beauty of what you get from real work is multidimensional. First you have the beauty of real wood like the table tops I am applying finish to this morning and as shown above. In this case, the wood, with its character and interesting figure tells the story of the forest from which it came and stimulates regard and respect for that forest. 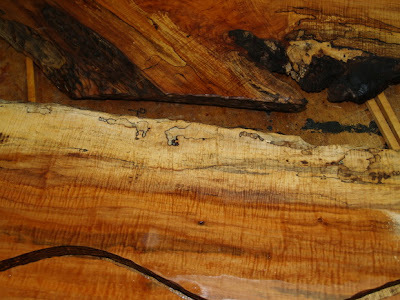 This wood came from here in Eureka Springs, and thus describes the hidden beauty in our own community. Then when you buy work from a local craftsman, you have set in motion the transformation of character in which we are challenged and empowered in the direction toward personal growth. All this involves a very simple thing, craftsmanship... the non-religious foundation of all the great works of human culture. Can a physical object be more beautiful and meaningful than the transformation of human lives, as we are shifted from mindless consumption toward alignment with creative spirit? When you have empowered transformation in your own community you have created real and lasting beauty. This is a no-brainer, but because we have grown so completely out of touch, I'm trying to explain it to a few people and working to get my language clear enough that anyone might understand. Since you are here, I assume you know most of this already, but perhaps you can help me spread the understanding, and put people back in touch with a more meaningful reality. *A tittle is a small distinguishing mark, such as a diacritic or the dot on a lowercase i or j. The phrase "jot and tittle" indicates that every small detail has received attention. When assembling a table made using round tenons, you have to be very careful to check that it is flat and square, so I am using a carpenter's square to check. 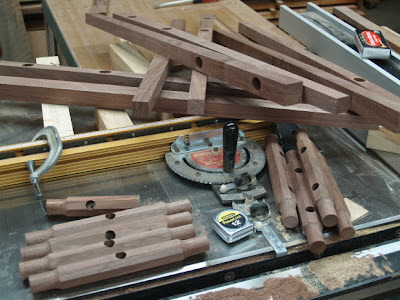 Rectangular tenons go together one way and one way only, but round ones can fit together at many very wrong angles, so checking and rechecking is a must. 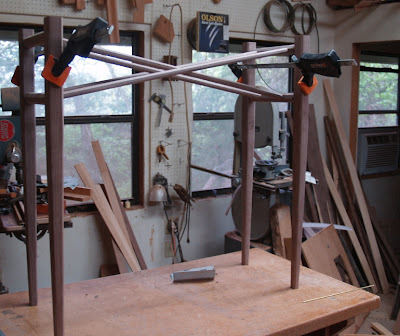 When the glue is set, however on the parts in this design, they have a great deal of strength and each glued tenon reinforces the positioning of the rest. I do my gluing on a flat surface to make very certain that the table will rest evenly, with each leg touching the ground. This table and one similar to it will be ready for applying finish and attaching the top tomorrow and will be ready for delivery to a gallery later in the week. There is an old saying, "I love work. I can sit here and watch it all day." Rest assured that doing real work rather than just watching is immeasurably more fun. 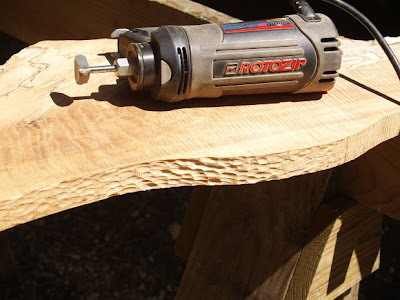 I have been using the rotary chisel in the Roto Zip to texture the edges of the table top and remove material from the edges that is too badly decayed. In fond memory of completing my Rustic furniture book, I am taking advantage of the beautiful day to work outdoors. 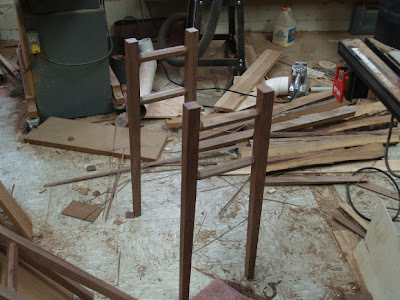 As you can see in the photo above, the tenons and mortises holding the table are formed, and I have done a trial assembly just to check the look. I will take the table apart for sanding prior to gluing the joints. I know there will be changes in the next tables, and I see this as the beginning of a series that will evolve over time, just as this particular piece is one that incorporates several of my earlier investigations in design and technique. The woods used are black walnut and spalted fiddleback soft maple. Today I am tapering legs for the tables I'm making. 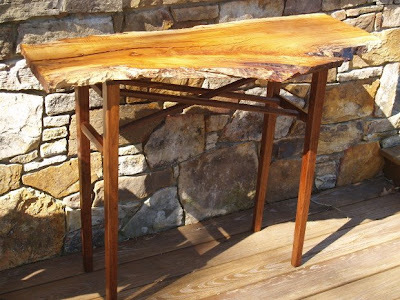 These will be an unusual design, combining rustic edges, a meandering cut through the top, and legs that have the elegance of more traditional furniture. Like nearly everything else I do in the wood shop, these tables are experimental. If I know exactly how something is going to turn out, what will I learn from it? 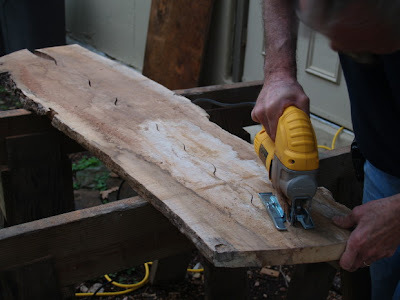 The simple tapering jig in use above is made with a piece of plywood and has a runner underneath like those used in more common table saw sleds. The jig carries the wood through the cut with the angle determined by the fence. To change the adjustment of the fence, you just reposition it with screws, and a small block at the end keeps the stock from sliding out of position. One added benefit I'll note concerning my new saw. The riving knife that rises from the saw at the back edge of the blade serves to hold the stock in position throughout its cut, making this task far easier and providing better, safer control throughout the operation. I can hardly describe for my readers the pleasure one can find in the creative process. You watch things happen in your own hands, guided by tools that have become old friends having shared so many creative adventures in your past. It is amazing to me that in our educational system and in our culture, we do so much to distract our children and ourselves from our creative potentials and the deep psychic rewards thereof. In the photos below, you will see some additional progress, first a trial fitting of the stretchers, then the holes drilled for the triangulating side to side stretchers. If you have read my book, Making Elegant Custom Tables, you will find this design technique in Chapter 4. The Clear Spring juniors and seniors in the economics block finished their incense burners which they are making as a marketing/production research project. They had fun and did some creative designs. 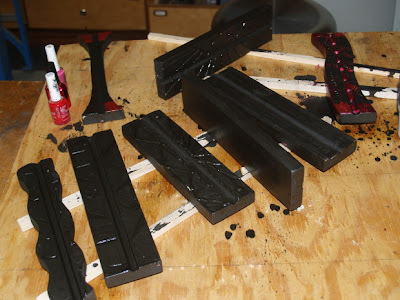 In the photo below they look goopy and gross with the graphite/shellac finish, but when they have been rubbed out with a scouring pad, they will look like hammered steel, and far more interesting. 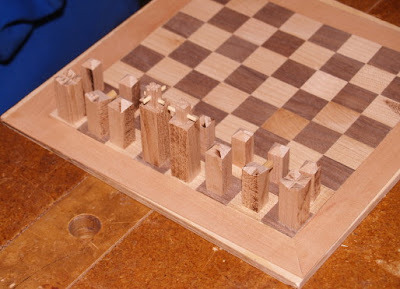 This morning in the CSS wood shop we continued work on the chess sets (5th and 6th grades). The students have been playing chess in their spare time and have really gotten into the game. The designs for the knights and bishops seem to have worked out well, and we came up with an agreed plan for the kings and queens which we will make next week. I wish I could get them to observe their work more closely, but that will come in time. I can remember my first work. There are things we just don't see until later when our sense of quality has matured. This afternoon in the wood shop we continued work on the boat (9th and 10th grades), and made jigs for stamping letters and numbers on the hardwood lids for Pete's periodic table of elements. I got a set of large letter stamps, which combined with the smaller set allow for writing the abbreviations for the elements along with atomic weight. 1. No craftsman is an island unto himself. We function in our work because we are encouraged by others to do so. We pay attention and apply care to our work because people notice and reward us with their kind thoughts. Things that are made with quality are made because there is encouragement for their making. It takes a village to raise a craftsman. If a single craftsman is honored, all are honored, along with the community and culture in which he or she has grown. 2. The message of the wisdom of the hands is one that people in the arts and craft community understand and wish to encourage. 3. I plan to use this acknowledgment of my work to further the cause, the promotion of crafts, woodworking and hands-on learning in schools, homes and lives. Wish us all luck. 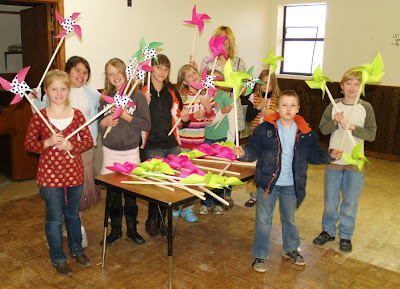 Today in the wood shop the 3rd and 4th grade students worked on more pin wheels to be used as decorations during the Clear Spring fund raising auction in May. With the first and second grade students we continued work on kangaroos, with the children beginning to nail their pouches in place and making baby joeys to go inside. We added two new students to the lower primary grades this week, so it seems that the school is on a gradual increase in enrollment. The current national trend is for declining enrollment in independent schools, but we are doing many things right and parents notice. 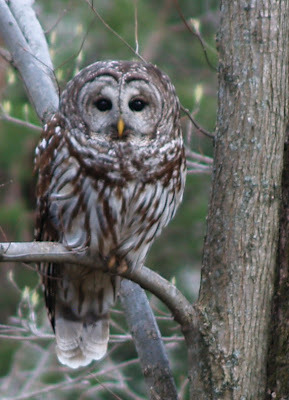 My owl is again on his(or her) favorite perch. This may get boring to readers though it never would to me. 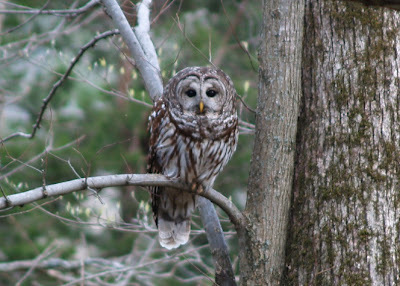 I heard the barred owl in the woods this afternoon, and then this evening, he (or she) was sitting on a branch posed for photos. While the camera was on a tripod, the photo was taken with low light conditions and with a telephoto lens, so focus isn't perfect. I take pleasure in my encounters with wild things. You will notice a slight difference between these and earlier photos. You can see dogwood leaves opening in the background. Tonight we are expecting below freezing temperatures. what is the value and meaning of work? Today I will spend another day competing with the Chinese. I have some small boxes to make to fill holes in my inventory and I will work on two tables I've started. I will spend some time at school getting ready for tomorrow's classes. When something is made, start to finish, by a real human being, the consequence is greater than the shaping of the object made. The materials used in making the object came from someplace where their loss may be felt, like the opening in the woods where a tree once stood. The time used in making was allocated away from other things; Less time in front of the TV, perhaps. The maker of the object was also shaped in profound ways. Perhaps he or she had done the same things thousands of times before, and worked mindlessly and to little internal effect. Or perhaps the maker worked attentively, caring for the perfection of each detail, shaping his or her inner landscape with unseen consequences. While one maker may have cared nothing for the act of making, another may have envisioned it as a process of unification with the creative forces inherent in the universe. As I wander off to the wood shop to compete with the Chinese, which shall I choose today? You, as a maker or consumer will make choices of your own, either *building culture and society by grasping your own creativity and enabling others,* or by choosing expedience over quality and shopping for best price regardless of consequence to community. When these decisions are made by an individual, the consequences seem small, almost unmeasurable. But when a whole society makes the same choices, the impact is enlarged to the point of overwhelming. We see this in the degradation of our planet. So we now are challenged to change things. See *above* to know what. We Traveled Rivers. Doug Stowe built this reading table on commission for a traveling exhibit on Arkansas literary history. 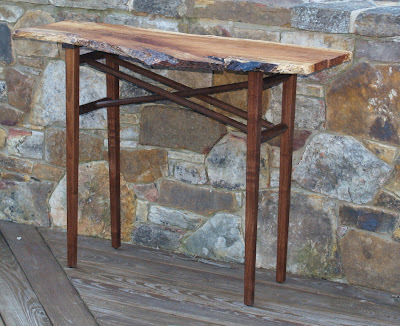 The piece features Arkansas Ozark sugar maple, loose rocks Stowe collected himself, and a center-gap design that accommodates seasonal wood movement. Stowe finished the piece with Deft Danish oil and added a top coat of satin polyurethane spray. The work was first featured in FWW 117. 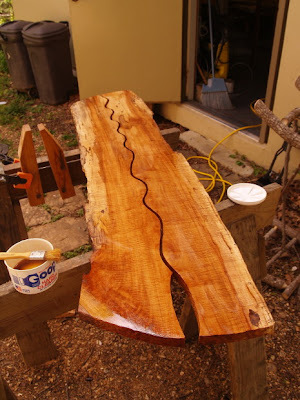 The free-flowing, irregularly shaped top on Stowe's planing bench (20-3/4 in. deep by 67 in. long by 37-/4 in. tall) was salvaged from an 8/4 walnut plank resting in his barn. 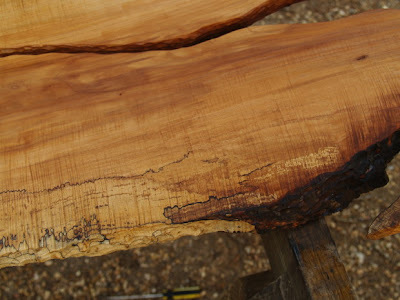 Choked with wandering pith and pocked with checks and decay, the plank was unsuitable for fine furniture, so Stowe cut away the defects and retained the irregular edges created in that process. The gaps in the assembled top are handy spots to locate clamps. After applying the finish (linseed oil, Danish oil, and paste wax), Stowe and his wife christened the bench with a candlelight dinner, complete with fine wine, fancy tableware, and good friends. You can see Pestalozzi's principles illuminated in Froebel's method. Froebel, in the process of "Inventing Kindergarten," developed "gifts", educational objects that grew in complexity from the simple colored balls on strings to his 19th gift, "sticks and peas" from which Buckminster Fuller discovered the geodesic dome. His last gift, the 20th was modeling clay. Associated with each gift were "occupations," actions that might be done with each to express learning. The belief was that learning and expressing both in the concrete and abstract were essential to development, and that concrete expression was the foundation for the abstract. If you want to know what abstract expression means, think of a standardized test. If you want to know what concrete expression means, think of something you might actually make or do. If you note that the outcome of our present system of education is complaisant consumerism, you can rest assured that the outcome of progressive education is active citizenship... something too scary for those with authoritarian ambitions to contemplate, which may explain why Freobel's schools were shut down by the Kaiser of Germany. If you understand the relationship between Pestalozzi, Froebel and Salomon, you begin to come to a greater understanding of Sloyd. When Uno Cygnaeus was given authority by the Russian Czar to establish the Finnish Folk Schools, he was inspired by Froebel's Kindergarten movement and realized that crafts were the perfect means through which to extend Pestalozzi's Anschauung and Froebel's "self activity" throughout the school, and well beyond the Kindergarten years. 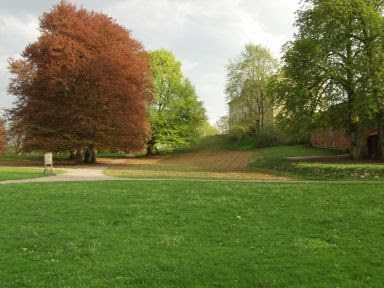 Salomon realized the importance of Cygnaeus discovery and developed his teacher training school at Nääs to spread the gospel of progressive education. 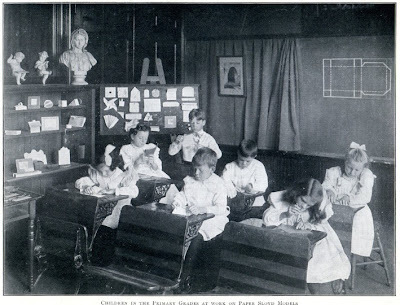 The photo above is from Edna Anne Rich's 1905 book Paper Sloyd showing kids just beyond the Kindergarten age, preparing for woodworking Sloyd through work with paper. On the shelves and bulletin board you see finished paper models and on the blackboard, the design of the object being made. Edna Anne Rich was a graduate of Gustaf Larsson's School in Boston and Otto Salomon's School at Nääs. As a point that might interest you, my 3rd and 4th grade students at Clear Spring School love paper sloyd. how can they be ready for that?